With Tuesday’s decision, the German MoD rejected a proposal by U.S. UAV manufacturer General Atomics to procure its Predator unmanned aircraft. German forces are already using Israeli-built unarmed Heron UAV in their Afghanistan deployment with the NATO-led Resolute Support mission. 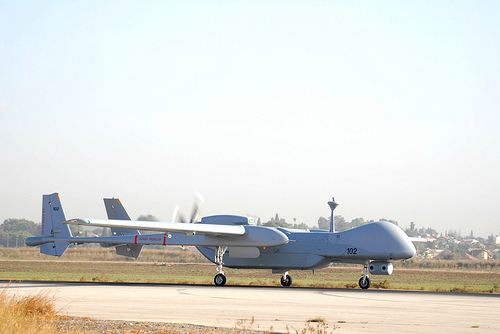 Three Heron have been leased from Israeli Aircraft Industries and are operated by Airbus Defence&Space, a model which is likely to be duplicated for the advanced Heron TP drones. Taking advantage of the close industrial cooperation between Germany and Israel, and building on the experience in Afghanistan, procurement of the Israeli drone might speed up the procurement process one year or more compared to the U.S-manufactured Predator, ministry sources said. While the aircraft will be on lease, armament for the drones will be purchased by the German military. Ministry sources said they are looking into arming the drones with short-range guided missiles but refused to identify which make would be considered. The case of armed drones is a sensitive political issue in Germany, where lawmakers fear that armed UAVs might lead to targeted killings along the lines of U.S. or UK forces and the CIA. Last year, the defense minister conceded she would seek parliament approval not only for deployments as usual, but especially for arming drones on a certain deployment. Between three and five Heron TP systems might be leased, a ministry source said. The aircraft will be operated by the Luftwaffe’s Tactical Fighter Wing 51 ‚Immelmann‘ in Northern Germany but based in Israel and deployed where necessary, thus avoiding the difficult process of certification unmanned aerial systems for the German and European air space. The procurement is planned as a bridging solution until an European UAV under development by Germany, France, Italy and Spain is expected to be operational in 2025. In a separate decision, the MoD is looking into expanding its fleet of unarmed Heron recce drones: For the upcoming German deployment with the United Nations mission in Mali, additional Heron UAV could be leased to allow long-range surveillance in the West African country, ministry sources said. Re-deploying the existing Heron drones from Afghanistan to Mali had been ruled out as the mission in Afghanistan is still ongoing and plans for a reduction of troops have been shelved. 3 bis 5 Systeme. Sind das dann 3-5 Drohnen oder besteht ein System aus 3 Drohnen? Heron TP: M.M.n eine sehrgute und pragmatische Entscheidung und mit Spike eine Bewaffnung vom Feinsten. Denn die kann man auch noch 5 Meter vor dem Fenster stoppen. Eine politisch absolut förderliche Abkehr von der reinen US „Fire & Forget-Philosophie“. Dann kommt die „Eurodrohne“ wohl also am Sankt Nimmerleinstag irgendwann ab 2025, schön, da kriegt der kleine Timmi vom Postillion ja auch seine Playstation. Davon ab, wenn man die ISR oder irgendeine Drohne tatsächlich „braucht“, hat man endlich mal was Vernünftiges gegen die UBoote getauscht. Was man so liest dürfte die Heron deutlich weniger leistungsfähig sein als die Reaper-Drohnen. Anderseits spricht vieles für die Entscheidung: BW-Personal ist bereits auf ähnlichen Gerät trainiert, man hat Erfahrung mit der Herstellerfirma, die Drohne dürfte deutlich billiger sein als das Reaper-System, man reduziert die Abhängigkeit von den USA, man hat mehr Einfluss auf die Entwicklung. Zudem kaufen die Israelis auch deutsche Waffen. Alles in allem eine erstaunlich sinnvolle Entscheidung. Ich hoffe nur, dass jetzt nicht auch noch Milliarden in eine EU-Drohne versenkt werden. Warum tut man sich nicht mit den Israelis bei der Weiterentwicklung der Heron zusammen? So ganz habe ich noch nicht verstanden, warum die Debatte jetzt unter der englischen Version fortgeführt wird und nicht unter dem deutschen Haupteintrag, wo sie hingehört… Aber wie ihr wollt. Was man so liest dürfte die Heron deutlich weniger leistungsfähig sein als die Reaper-Drohnen – wo liest man das? Quelle/Link, damit wir’s alle lesen können? Would be great if the comments in an english article would be english too, wouldn’t it? @T. Wiegold: looking at the manufacturers websites reveals that the certifiable predator B has 80% more payload capacity and 10% more endurance than Heron TP. You can also look at the UAS Market Survey that is published every two years by the Teal Group Corporation. This survey reveals that the French Senate determined in 2013 that Predator offered significant performance advantages over Heron TP, including greater endurance and payload, higher flight speed, an existing armament capability and faster data speeds with satellite uplinks. Furthermore the Predator (Block 5) package was 25% less expensive than Heron TP and offered a greater share for the French industry.